You see them on TV all the time. Usually, they’ll play late at night or in the early morning. Most of the time, they’re usually “As Seen On TV” products. A copper, non-stick pan? A pillow that gives you the best night’s sleep every time? Yeah, those are great products. Good enough for you to buy two, right? Those are an example of infomercials that are not scams. However, there are infomercials that exist that are all part of some scam. Since infomercials exist on TV, it would be hard to distinguish what is real and what is fake. Thankfully, this article will show you exactly how you can tell a real infomercial from a scammy one so you don’t become the next victim. It is always important to know what scams are in existence. 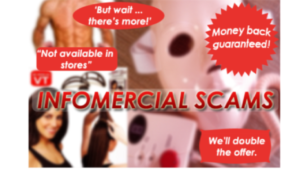 So, let’s dive into what these infomercial scams consist of and how you can protect yourself from them. It’s unclear when these infomercial scams came about. But, there is one notable case where infomercial scams came to light. One notable figure that can be associated with this type of scam is Kevin Trudeau. The Federal Trade Commission (FTC) began keeping an eye on Trudeau in 1998. They fined him $500,000 for his role in deceptively advertising a product line known as Eden’s Secret Nature’s Purifying Product. Trudeau falsely claimed that the product was designed to boost a person’s immune system. Trudeau then started an infomercial where he claimed that eating coral calcium would cure cancer. Once again, the FTC began to pursue Trudeau vigorously. In 2007, they ended up obtaining a court order that would bar Trudeau from making infomercials for three years. Trudeau believed that his First Amendment rights were being infringed. In retaliation, Trudeau began to promote books rather than diet supplements in a new set of infomercials. As of 2019, Trudeau is serving time in federal prison as part of his dealing in scam activities. Typically, there are two kinds of industries that are hotbeds for infomercial scams: the money making (i.e.–Get rich quick) and health industries. 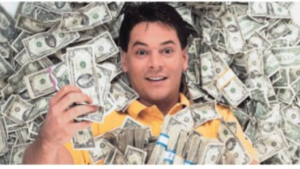 Some of the infomercials you’ll see, if any, will have these bold and too good to be true claims about making enough money to be a millionaire in a short amount of time. Not to be outdone, there are some infomercials that pose as health products that claim to cure certain illnesses and diseases. When it comes to health products, this may be considered a very dangerous thing. Examine The Infomercial: If you notice that something looks digitally added, the product may be a potential scam. The infomercial will have a picture that will enlarge the item so you can see it. You should see a caption that says “picture enlarged to show detail”. You should Google the picture to double check. Decide If The Product Is Realistic Or Not: Keep in mind that not all products were made to be perfect. It will have its pros and cons. Some people will like it and others won’t. Yes, there will be products that claim to be fireproof, waterproof, unbreakable, foolproof, etc. At the same time, check to see if there are any flaws like “this item is too big to take with you, but call now in the next half hour and get a portable version absolutely free”. Always check for realism. Get Opinions: As you’re watching the infomercial, you’ll need to make a note of the product. Get the name and Google it. Carefully read through all the reviews you come across. Obviously, some like the product and others won’t. You should go by the majority opinion of what the reviews are. Google the manufacturer of the product as well. But Wait, There’s More: Find out what else they offer in terms of products. Sometimes, they have other products are selling plus any bonuses they offer for free. It may be a scam if the infomercial will always offer the same upgrade or free gift when you see an infomercial repeatedly on TV. Check The Price: The common price for most of these products is $19.99. Alternatively, they’ll offer “X easy payments of $Y”. The payments may not be as easy as you think. What Is The Value? Most infomercials will tell you that it’s worth a large sum of money for a product. But they’ll reduce the price. However, the price is not what it might be. Because you’ll have to pay shipping and handling. Some companies may even hit you with false charges. If the company continues to falsely charge your credit card, contact the credit card company. Weigh The Pros and Cons: After all these judgements, you might think the product isn’t worth it. If it has a mistake or two, it may be a product worth investing in. If it has more than 4, 5, or 6 mistakes, that should be a product to stay away from. The obvious way to protect yourself is to do your due diligence. If you decide to purchase a product, you’ll need to be aware of how the customer service representative treats you. You may deal with professional, kind operators or some rude ones. Never under any circumstances answer personal questions like “what is your social security number” or the like. If this happens, then cancel your order. Warn them that if they still send you the product, you will report their company. It may be hard to distinguish which infomercials are real and which ones are fake. But knowing what to look out for in terms of the infomercial itself or the product will help protect you from becoming a victim of these type of scams. Be sure to pass this along to those in your family who may be vulnerable to scams like this. Do you have any experience with being scammed by a late night Informercial? Do you have any questions concerning my scam review on Informercials? If you do, please leave your comments or questions below, and I will be more than happy to get back to you. Thanks again for checking out my post, and good luck with your success online..